Spectacular view of Vernazza’s harbor in Cinque Terre, Italy. “Oh, my God! It’s straight down,” exclaimed one passenger. His friends laughed, but it was easy to detect a nervous undertone to their merriment. Another passenger tensely uttered, “This is scary. I hope he stays on the road.” We just looked at each other and smiled. Having just come from four days in Sorrento, Italy and the stunning Amalfi Coast, we were used to the narrow roads winding along the precipitous cliffs of Italy’s southwest coastline. We were on a local bus from Capri heading to Anacapri. And like our days touring Sorrento, Positano, Amalfi, and Ravello, we were just amazed at the breathtaking views Of Italy’s coastline. The sun sets on Manarola in Cinque Terre, Italy. 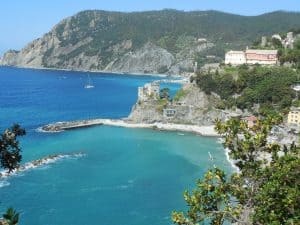 We were spending two weeks in Italy, but having visited Italy’s “big three” – Rome, Florence, and Venice – in the past, we were touring some of Italy’s most picturesque spots – the Amalfi Coast, the Isle of Capri, the Tuscan countryside, and Cinque Terre. The logistics of a visit to all of these destinations in a two-week trip prompted us to find a tour company to do the planning. So, we made a visit to the largest and most experienced tour company for Italy – Perillo Tours, which launched its customized tour division, ItalyVacations, in 2009. Perillo took care of everything – hotels, excursions, and all transportation within Italy, including trains, ferries, and private car service. Our entire trip ran like clockwork. Our Italy adventure began in Sorrento, a town popular with both foreign and local tourists for its Mediterranean climate. Visitors are attracted to its stunning views from the many luxury hotels perched on the sea cliffs; its proximity to the Amalfi Coast, Capri, Pompeii and Mt. Vesuvius; and, of course, its prized limoncello. 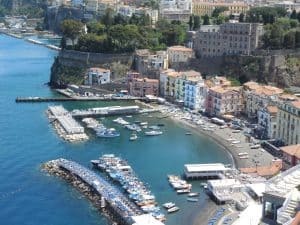 We spent parts of two days exploring the town’s main attractions like Centro, the old section of Sorrento, the Piazza Tasso, the town’s main square, and its quaint waterfront. As we wandered Centro’s narrow streets and alleyways, we stopped at some of the many colorful shops, enjoying a meal at one of its quaint trattorias, and sampling – what else – the limoncello. In many places, the town’s streets are lined with lemon trees sprouting lemons the size of grapefruits. But avoid the temptation to pick one; the fruit is protected by law. Another day we took an escorted tour of the archaeological site of Pompeii, which had been buried under 13-20 feet of volcanic ash and pumice after the eruption of Mount Vesuvius in 79 A.D. It was fascinating to view the numerous intact buildings, artifacts, and even skeletons frozen right where they’d fallen – all completely preserved under the thick blanket of volcanic dust. The tour also included a drive up the volcano, where we took the final 25-minute hike to the crater’s edge. Views of the caldera and surrounding countryside were astounding. The highlight of our stay in Sorrento was an escorted tour to the Amalfi Coast, which included stops in the enchanting villages of Positano, Amalfi, and Ravello. Positano, “the vertical town,” is best known for its colorful pastel-painted houses and cantilevered hotels and villas that cling to the vertical terrain. As we made our way through the narrow alleys and twisty streets, the views of the village reminded us of picture postcards. Amalfi, the largest town along this coast, has a quaint seafront promenade and numerous medieval buildings of historical interest. Be sure to enjoy a traditional Aperol Spritz in one of the cafes along the waterfront. Ravello, which is perched on the cliffs above the coast, is a charming village with a number of beautiful gardens and opulent villas ready for exploring. Ravello is also famed for its classical music concerts. However, the main attraction of our Amalfi tour was the drive itself. The Amalfi Drive offers some of the most dramatic coastal scenery in the world. Our next destination was the beautiful Isle of Capri for a two-night stay. The island is just a short ferry ride from Sorrento. The stunning scenery and easily defended location because of the soaring cliffs of the island prompted the Roman emperors to make Capri their vacation hideaway. 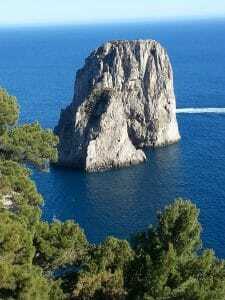 Faraglioni Rocks on the Isle of Capri off Italy’s southeastern coast. A great way to view Capri’s majestic beauty is to take a boat ride around the island where you will be able to journey into many beautiful grottos along the soaring cliffs. Your guide will take you through the iconic Faraglioni Rocks – and, of course, to the entrance of the famous Grotta Azzurra (Blue Grotto). We also experienced some stunning views by taking the chairlift to the top of Monte Solaro. The chairlift is in Capri’s other town, the less touristy, less glitzy Anacapri. We also suggest taking one or more of the walks or hikes from the town of Capri. The relatively short hike to Arco Naturale (Natural Arch) is well worth the effort, and be sure to visit Jardins d’August, the botanical gardens with beautiful sea views just outside of town. 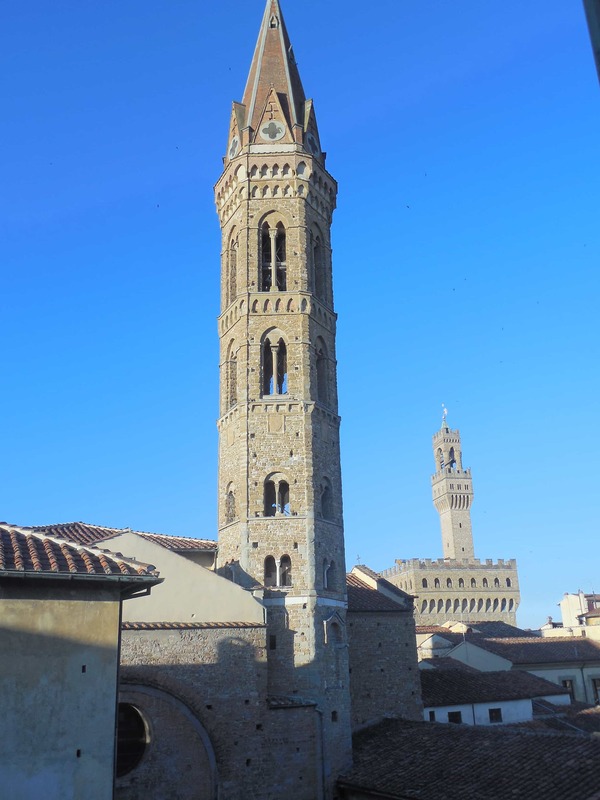 Our 3-night stay in Florence was planned as a home base for our excursions to some of the charming, picturesque hill towns of Tuscany and Umbria – Siena, San Gimignano, Cortona, and Assisi. Siena, a UNESCO World Heritage Site, is famous for its cuisine, art, museums, medieval cityscape and the Palio, a traditional medieval horse race run around the Piazza del Campo. Siena’s seventeen Contrade (neighborhoods) vie for the trophy twice a year, on July 2 and August 16. San Gimignano, the Town of Fine Towers, is known for its medieval architecture, particularly the preservation of fourteen tower houses. Also a UNESCO World Heritage Site, San Gimignano is as charming as it is historical. And for a perfect ending to our day, we enjoyed a five-course gourmet dinner and wine tasting at a traditional Tuscan winery. Cortona and Assisi, two more hill towns of Italy’s central region, are quaint, picturesque villages. Assisi is revered as the birthplace of St. Francis, patron saint of Italy. 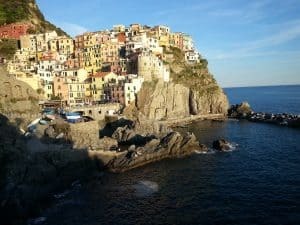 Our final and probably most endearing destination was Cinque Terre (“Five Lands”), a series of five little towns amazingly constructed into the steep, terraced hillsides of this seductive 10-kilometer stretch of the Italian Riviera. 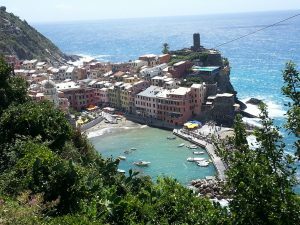 The five towns, the coastlines, and surrounding terraced hillsides are all part of Cinque Terre National Park and is another UNESCO World Heritage Site. Each of the villages is a picture-perfect collection of pastel-colored homes and shops flowing down to a picturesque sea, except for Corniglia, which is perched high on a bluff above the sparkling blue waters of the Mediterranean. Because of their natural isolation, cars are thankfully scarce, and in some areas of the villages, non-existent. All of the villages are connected by train service, making travel between them easy. But most people come to Cinque Terre to walk the trails. Although two of the connecting ones have been closed for some time because of landslides, hikers will find more than enough challenge on the remaining connecting routes and even more on the hillside paths above the towns. The trails have what sometimes seem like endless steps, but the magnificent views make the effort worth it. Certainly, your first trip to Italy should include the “big three” cities. They are iconic. But for your next trip, consider visiting the destinations that are pictured in the most dazzling scenic postcards of Italy. Visit these websites for more on planning your visit.